Students at Anne Watson Elementary at Bigelow logged more than 2,000 miles during the school year as part of the school’s running club. According to principal Amy Jones, a little more than 80 students regularly attended running club during the 2017-18 school year. As part of the club, the school hosted its inaugural Ugly Christmas Sweater Run in December, with first- through third-place medals presented to winners in each age division. 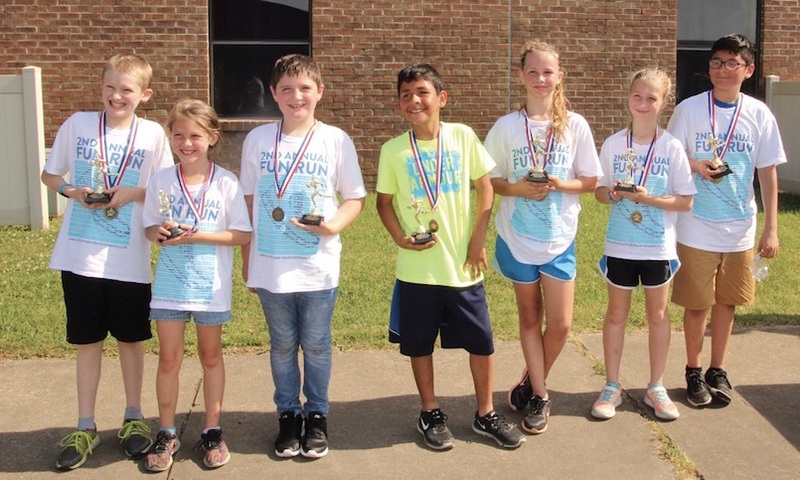 The school also ended the year with its Second Annual Fun Run with medals for the first-place boy and girl in each division. All participants received a medal. Running club award winners Josiah Mahar (from left), Lexi Bisbee, Brayden Dielmann, Arturo Cabrera, Hana Staples, Bella Johnson and Diego Rangel. Jones said that every student who ran 20 or more miles received a T-shirt, and at every five miles, students were awarded charms. “Students who participated more than 80 percent of the time were rewarded with a fall and/or spring field trip,” Jones said. The running club, in its second year at the school, recorded 2,010 total miles. The Conway Regional Women’s Council has supported the school and running club with teacher’s grants the last two years. “The Women’s Council grant is something that we celebrate and feel blessed to have received. We have been able to reach a tremendous amount of students as well as their families through the running club we started with this grant,” the principal said. The grant has given the school another way to connect with students, according to Jones. “Most things come easy to teachers in the classroom, but for the students to see us struggling and running beside them, it has given us one more way to build relationships with our students.